Aditya Birla Retail Limited is the retail arm of Aditya Birla Group, a $40 billion corporation. The company ventured into food and grocery retail sectors in 2007 with the acquisition of a south-based supermarket chain. Subsequently, Aditya Birla Retail Ltd expanded its presence across the country under the brand ― "more." with two formats ― Supermarket and Hypermarket. “More” is a one-stop shopping destination for the entire family. Besides a wide range of products across fruits and vegetables, groceries, FMCG products, more also has a strong emphasis on general merchandise, apparels and CDIT. 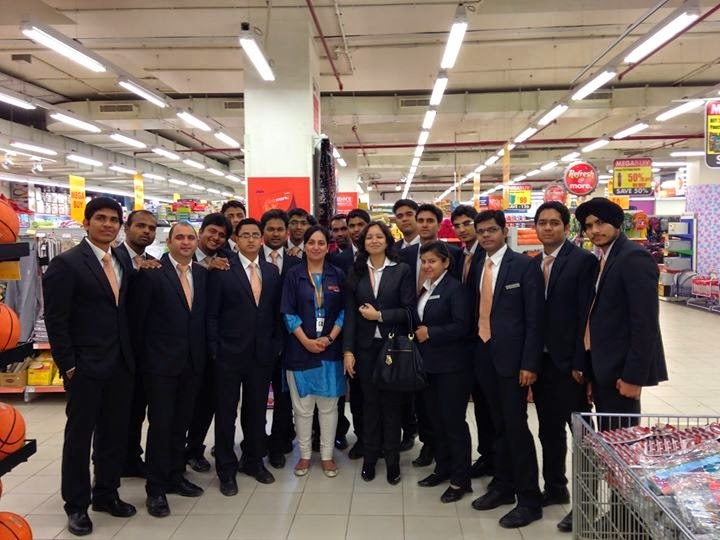 On the 28th of March 2014, students pursuing International Business Management from INLEAD visited Aditya Birla Group-More Hypermarket in Gurgaon. Hypermarkets are what can be described as a complete destination shopping area, where one can enjoy a day out with the entire family because of a simple fact that hypermarket consists of variety of options under just one roof. The result is a very large retail facility which carries an enormous range of products like grocery, fruits & vegetables, general merchandise, electronics, computers, mobile phones, apparel, footwear sports and FMCG products, with national, international and house brands all under a single roof. The visit ended with an interaction with the HR manager in More Hypermarket and helped students to become more aware of the retail operations. Sarath, student pursuing International Business Management from INLEAD: Challenging to see the management and inventory of so much of detailed product line.